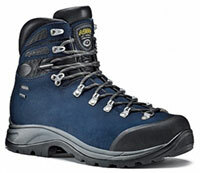 Asolo says:"One-piece water-resistant 2,4 mm Perwanger leather upper. Gore-Tex® lining, waterproof and breathable. Midsole in Eva mono density. Outsole "Radiant" Asolo/Vibram® highly technical sole, the balance of the outsole has self-cleaning lugs designed for optimum performance on varying types of terrain. Classic lacing system. Toe rubber cap." At go4awalk.com we are big fans of Asolo Walking Boots and Tribe GV do not disappoint. Wonderfully comfortable straight out of the box they feel nice and secure on my feet with no slippage or movement in my heels. The classic lacing system starts close to the toe box allowing the boot to tighten all the way up. As is common with quality walking boots the lacing system incorporates a pair of locking lugs so I could tighten the bottom section of the boot and lock it before tighten the top around my ankle. As with the Asolo Khumbu GV MM there is an extra loop on the tongue through which the laces are threaded to ensure the tongue is correctly positioned for maximum comfort and weather protection. The toe box is very stiff and strong offering superb protection to your toes but there is no rand around the sides and back of the boots so we will have to see how that wears under regular use (no problems so far). The upper is suede (our pair are blue - pictured - which I love) which is easy to clean with a stiff brush but does benefit from reproofing spray to stop it fully drying out. The uppers however are not very thick which helped keep my feet nice and cool but suggests that while these walking boots are ideal for spring, summer and autumn mountain walking, something a little warmer would be needed while padding through the winter snow. The lining is Gortex so the Asolo Tribe GV Walking Boots are waterproof and breathable and the semi-stiff sole is flexible enough to be comfortable but will just about take a crampon - but as I said earlier, if you plan extensive winter snow walking you might consider a different boot. The Vibram sole offers plenty of grip and is thick enough to be comfortable on rocky ground. The lugs are arranged in two ovals and widely spaced and the manufactureer suggests that they are 'self-cleaning'!. Sadly, I could find no evidence that this worked - but the grip on mud and stony ground was nice and sure. Superb three-season walking boot offering sureness of tread and great stability. Perfect for spring, summer and autumn jaunts in the Lake District, Yorkshire Dales, Snowdonia and the Brecon Beacons whilst equally at home on canal towpaths and cycle tracks.